A few times a season, the term “offensive charts” has a double meaning. This is one of those times. Apologies in advance. Luke Timian’s absence from the chart above is the lead story. Last week, I noted Timian’s absence in the 2nd half against Ball State, but I – rather optimistically – chalked it up to the game situation. Nope, Luke was hurt. He’ll apparently be a game-time decision this week against Rutgers. In his absence, J’Shun Harris saw the most action as a receiver he’s seen since his true freshman season back in 2014. With Whop Philyor nursing an injury he suffered (and played through) during the MSU game, Harris is in line for more playing time against Rutgers…pray for J’Shun’s ligaments. Speaking of odd absences from games, Reese Taylor appeared in five of IU’s first eight possessions against Sparty, and then didn’t show up at all in IU’s last seven series. Given the game situation, with IU needing to pass to catch up, and Timian’s injury, I would have guessed Taylor would have seen action in the slot and out of the backfield throughout the game. Like last week with Timian, no one has said anything about an injury to Taylor, but the decision not to play him late against Michigan State makes more sense if he was nicked up, and this staff, although slightly more forthcoming about injuries than the previous regime, certainly doesn’t feel the need to volunteer injury info. I won’t feel comfortable about Taylor’s status until he enters the game on Saturday. True freshman Ronnie Walker played in his 2nd game of the season on Saturday and is therefore halfway to the maximum amount of games he can play while retaining his redshirt. But he only played for one series – a three and out – and tallied just one carry. If the coaching staff is truly still considering redshirting Walker, that’s an odd way to spend one of his four games. Everyone knew running the ball on Michigan State would be difficult. No one expected IU to run for over 200 yards again. But I expected more than this, and by “this” I mean the charts above that show a rushing offense that was completely neutralized. I thought the maturity and continuity of the offensive line would help them hold their own against a big, strong and athletic MSU front seven, and I hoped that Stevie Scott’s patient, powerful running style could lead to some decent yardage. Neither came to pass. Also, look at that cute little Broken Tackles chart. That’s right, IU ran 78 offensive plays and forced just one missed tackle. That’s an incredible performance by the Spartan defense, first and foremost. Stevie Scott, IU’s leading tackle-breaker thus far, was seemingly hit within a yard after receiving the handoff every time, and therefore never had the opportunity to build the momentum that helps him break tackles. On 6 of his 11 carries, 55%, he was first contacted by a defender at or behind the line of scrimmage. Headed into the game, that rate stood at 33%. And they said a team couldn’t possibly throw 44 passes and only have 1 of them travel more than 20 yards downfield…Mike DeBord sure showed them! Jokes aside, this offense simply has to attempt more deep throws than they did against Michigan State. After the near miss to Reese Taylor on the wheel route in IU’s first series, IU didn’t attempt another deep pass all game (excluding a pass on which Donovan Hale drew a defensive holding penalty). [ref] By the way, who knows how that game turns out if Ramsey’s throw is about 2 yards shorter, Taylor catches it in stride and takes it to the house. Sigh. [/ref] I really don’t think it’s an ability or arm strength issue either. Ramsey has shown already this year that he possesses more than enough arm strength to make deep passes – as I’ve said before, intermediate passes are more of a challenge from a pure arm strength perspective. Either Ramsey needs to take deep shots when they are called or more deep passes need to be called. While Donovan Hale, Nick Westbrook and Ty Fryfogle may lack top-end speed to create separation, they are still legitimate options down the field. And, of course, the Whop Philyors, Reese Taylors and J’Shun Harris’ of the world are also capable of getting open down the field. It’s time to take some shots. Or, quite honestly, if the coaching staff isn’t comfortable with Ramsey taking those shots (which I doubt), then they need to play Michael Penix. It’s hard enough to operate offensively against a defense like Michigan State’s when they have to defend the whole field. When they only have to defend an area within 10 yards of the line of scrimmage, it’s virtually impossible to consistently move the ball. Moving to pass protection, there are a few different ways to look at IU’s numbers in this area. First, you could look at the total number of pressures and conclude that 15 seems like a large number. You would be right. Through three games, IU had allowed a total of just 13 pressures. Sparty more than doubled that. But then, you could look at the pressure rate of 28% and conclude that maybe IU’s pass protection wasn’t terrible. That is just about the IU defense’s average pressure rate for 2016 and 2017, and those defenses had pass rushes that were fine, but nothing to write home about. Dig a little deeper, however, and the overall pressure rate begins to look a little deceiving. 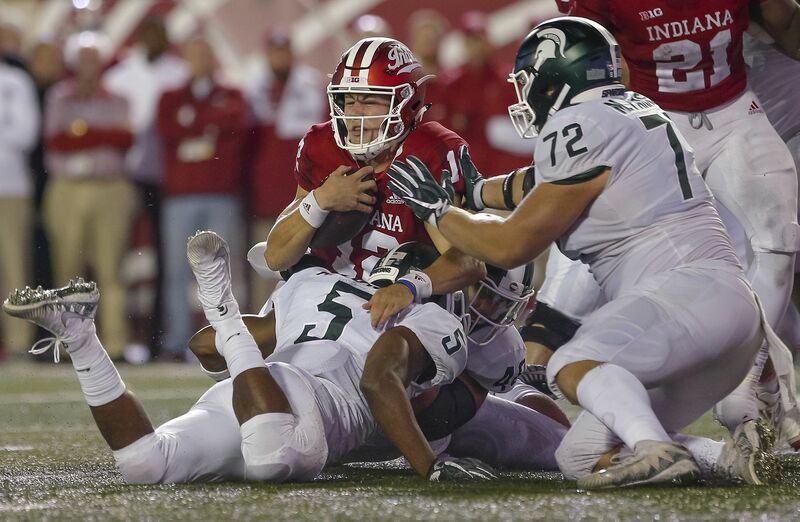 In the 4th quarter, when MSU was, for the most part, protecting a two-score lead and getting to the QB was not a priority, IU had 25 drop-backs and only allowed 4 pressures. If the 4th quarter is removed, IU’s pressure rate jumps to 38% for the first 3 quarters. When an offense is averaging more than 1 pressure per 3 downs, that’s a problem. As you can see, the primary source of IU’s problem was at tackle. LT Coy Cronk and RT Brandon Knight combined to allow 9 pressures. Most of those came at the hands of standout Spartan defensive end Kenny Willekes. As I mentioned on Twitter earlier this week, the former walk-on dominated IU’s tackles (especially Knight) throughout the game. At this point, Cronk and Knight are veteran linemen, and, along with Wes Martin, are the best IU has to offer up front. While they cannot be expected to neutralize a player like Willekes, I think it’s reasonable to expect them to hold up a little better than they did on Saturday.